Get everyone you know who is eligible to vote to verify their registration info, or register here (in Spanish too): https://wei.secstate.wa.gov/onlinevoterregistration/Registration.aspx or outside Washington, here: www.voteforchange.com. Realize the power of a question: "What is it that the Republican party stands for, anyway?" as people who are actually thinking can't possibly vote GOP now - especially for President! Don't back down on the insistence that the ultraconservative "heart" of the GOP has got to go - as it is corrupting the whole "balance of powers" and the rational process that distinguishes this country's history. A healthy two party system needs two healthy parties, and it is up us now to send a firm message to the Neo-cons that they are DONE. D-O-N-E.
Be aware of latinos.barackobama.com as a resource for people with questions about Obama's immediate plans, and position on issues. With the Internet we should and must go direct to the source! Our experience in the Northwest is that Democrats stand for "compassion for all people, and appreciation of diversity." Barack Obama embodies these core values in words, personal experience, and deeds. The Obama team is our best avenue for stopping the unrealistic policies that divide our families, and to create change that recognizes the Latino contribution to America fairly and justly. 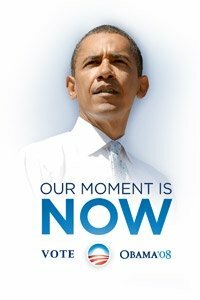 All Our Best, The Northwest Obama Team. Keep up with what is happening in Denver! Stew Henderson's Hourly Updates Right From the Floor! As you may have heard, Barack has been in Europe, the Middle East, and Asia this week. Today, he spoke in Berlin, Germany. In a city where a wall once divided the free from the oppressed, he talked about tearing down the walls that divide all peoples so we can address our common problems -- the threats of terrorism and nuclear weapons, global warming and genocide, AIDS and poverty. Barack speaks at a fundraiser in New York on July 9, 2008. Just a quick reminder of the three "Fourth of July" parades tomorrow taking place in Sedro-Woolley, Anacortes, and Guemes Island. Steve Crider and Brad Clure are bringing plenty of signs to carry in the parades in Sedro-Woolley and Anacortes respectively, for most of our Democratic candidates. Brad and Steve both have masks of Hillary and Barack for you to try your hand at having some fun to lighten the day so if you are game - gentlemen, bring a dark sport-coat whilst a pant-suit would be appropriate for the Hillary imitator! So, once again here are some details on our 4th of July Parades! The Anacortes parade will be lining up on "O" St. near the Port around 2nd and Commercial in Anacortes at 10:00 AM. Come help register voters before the parade too. The parade will go south on Commercial and end at the Park on 10th and "N" St. for a Patriotic event. Contacts for the Anacortes parade are Isabel Jones at wa-democrats.org and Brad Clure at brad@clure.com or 360.920.3958 cell. The "Famous Guemes" Parade is also on the 4th and Gail Nicolls is organizing for it, so contact her at guemesgail@cablerocket.com or her phone 360-293-9540. I understand the hot dogs are great! and the Entire Obama Team!